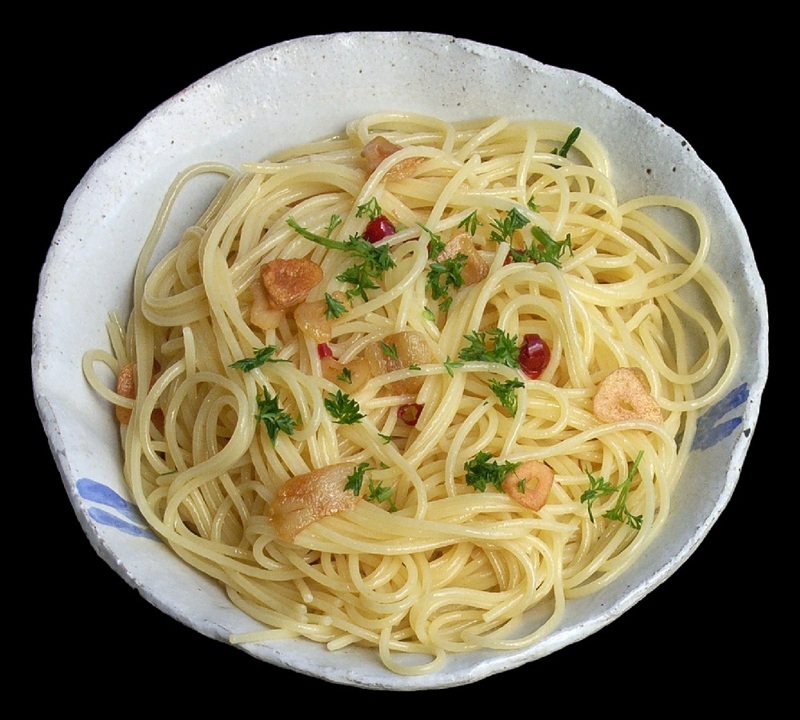 Spaghetti Aglio e Olio: Spaghetti aglio e olio (“spaghetti with garlic and oil” in Italian) is a traditional Italian pasta dish, said to originate traditionally from the region of Abruzzo, although it is popular across the country.The dish is made by lightly sautéing minced or pressed garlic in olive oil, sometimes with the addition of dried red chili flakes, and tossing with spaghetti. Finely chopped parsley can also be added as a garnish, along with grated parmesan or pecorino cheese, although according to some traditional recipes, cheese should not be added. Bring a large pot of salty water to a boil. Cook the fettuccine to al-dente (cooked, but still a little firm), time taken to cook the pasta al-dente should be on the packet. About 4 minutes before the pasta is ready, heat 100 ml of olive oil in a large frying pan. Sauté sliced garlic and chilli in the oil. When the garlic turns nut-brown, add 1/2 cup of hot pasta water to stop the garlic cooking any further. Remove the frying pan from the heat. Return the pan to high heat. Add the pasta, parsley and a little more olive oil. Note: Do not use tongs or spoon or spatula to cook the pasta in the pan. Use the swirling motion of the pan itself to mix the pasta in the pan. The pasta water and oil will emulsify thickening and coating the spaghetti. Season the spaghetti Aglio e Olioto taste with salt and pepper. Spaghetti Aglio e Olio is ready to be served. Sprinkle with parmesan, if you like, and serve hot. Copyright © 2019 Twist Of Food.